Infinite CBD sells a variety of products made from the purest, all-natural CBD isolate on the market. 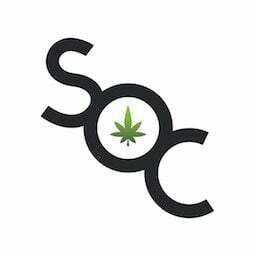 All their products contain less than .1% THC so you won’t get high but still get the health benefits of the cannabis plant. They add no harmful additives or chemicals to their products. Many professional athletes like UFC fighters, cyclists, and soccer players use Infinite CBD to help them train harder and improve during recovery. As an added bonus, the company offers yummy recipes like their homemade CBD Spice Latte. Sign me up! 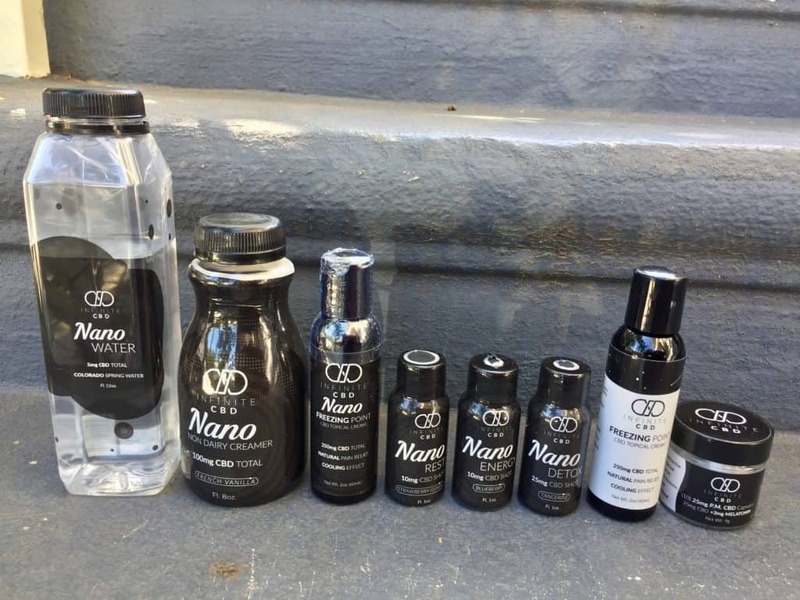 Read our other Infinite CBD Nano product reviews, we’ve had our hands on all of them. 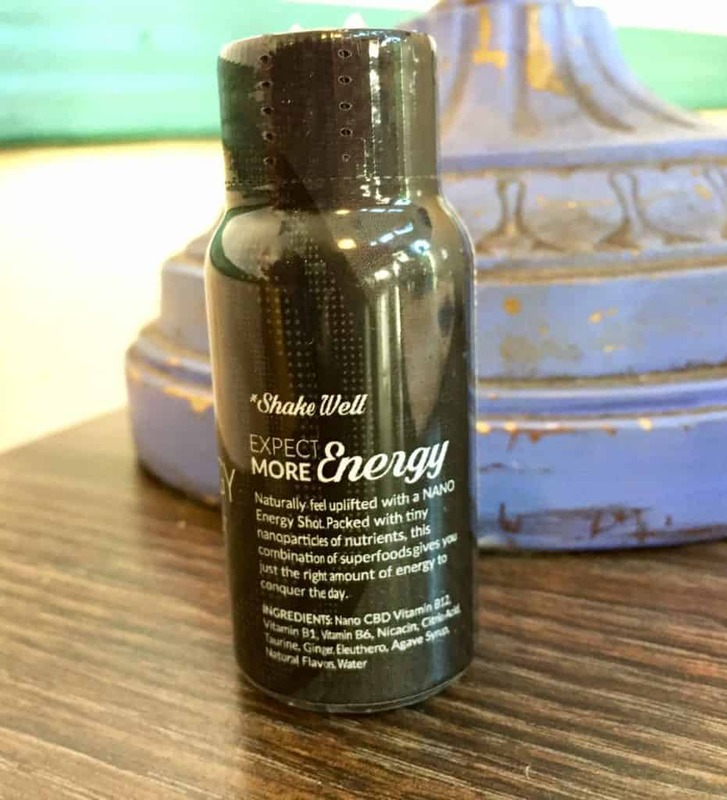 Infinite CBD makes an energy shot that threatens to put 5-hour Energy out of business. 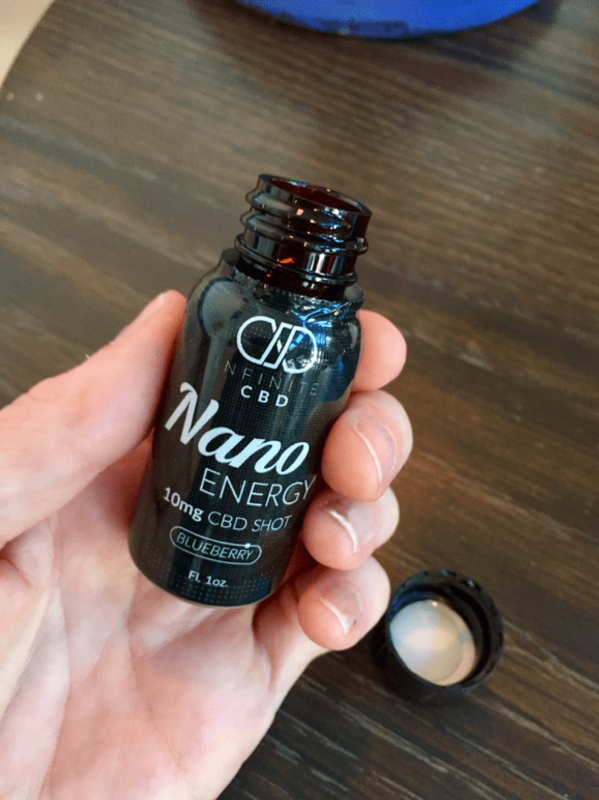 Containing 10 mg of pain-relieving nano CBD, this shot is packed with herbs and vitamins that will give you an all-natural boost of energy. It’s like drinking a cup of coffee but without all the jitters and eventual crash. The CBD nanoparticles work quickly and effectively in combination with energy-inducing ingredients that will help you focus through the pain. For over a decade I’ve only been able to work part-time because of chronic pain that I have due to some spine issues, and now I’ve reached a point where I can only work from home because of limited mobility. Working from home, it can be difficult to focus, not just because of all the distractions of being on one’s own schedule, but my pain and inability to stay in any one position make productivity a huge challenge. As a “painsomniac,” I love coffee, even though it can make feel cracked out. My hope with this energy shot was to get enough relief and focus to be able to get through a few hours of work without being too distracted by pain and without feeling jittering. I gave the bottle a shake and drank it down. The shot has a strong herbal taste that’s unpleasant, but it’s only a shot so I took it down like a champ. 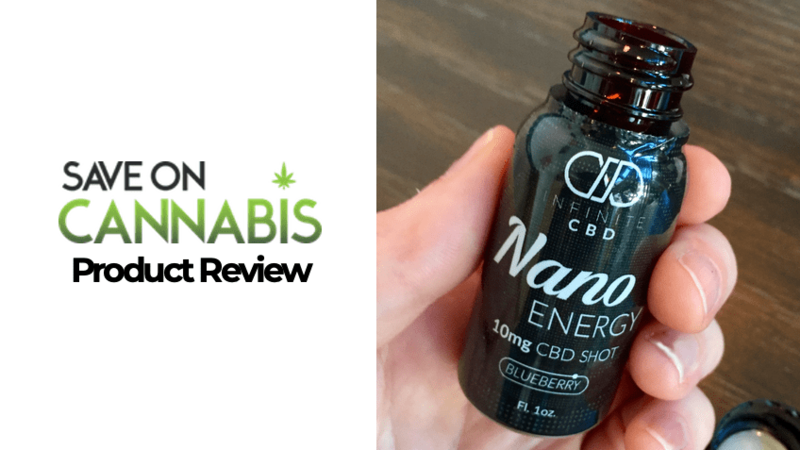 Infinite CBD’s energy nano shot is awesome! It gave me a focusing boost and didn’t make me feel jittery at all. I felt a pleasant warmth and calm take over. I was able to do a few hours of work on my latest project before I noticed how much pain I was in. 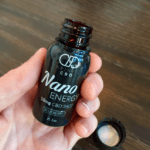 The combination of the nano CBD particles with the 5-hour Energy-like ingredients has the potential to replace my morning cup of Irish Breakfast tea. 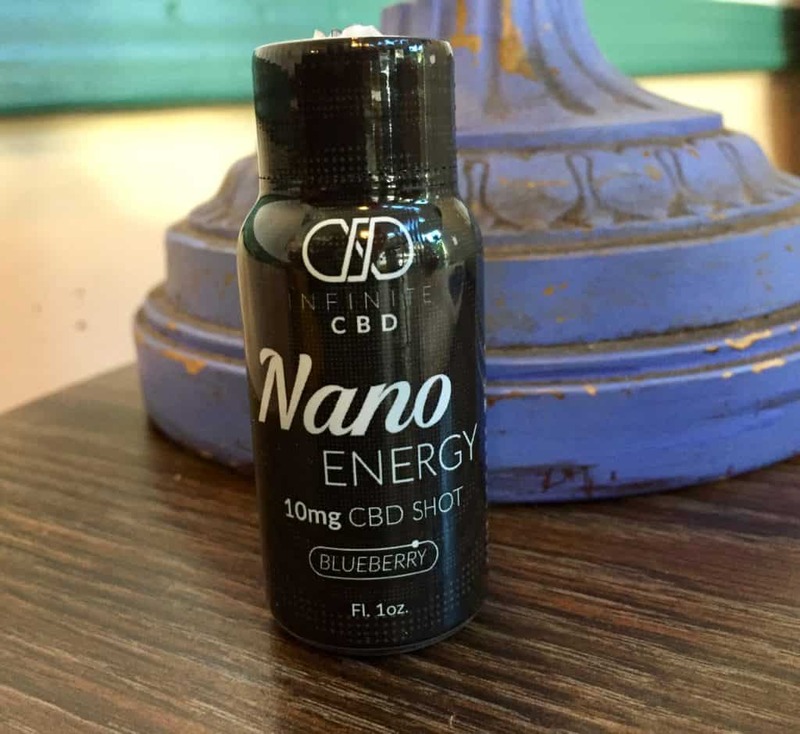 The herbs and vitamins added to the Infinite CBD Nano Energy Shot include a Vitamin B complex that aids in converting the foods you eat into energy. The ginger reduces exhaustion and helps with circulation. Eleuthero is an herb that helps the body deal with stress and fatigue. It also boosts the immune system and improves memory. Finally, taurine, when used in combination with B vitamins, helps with tiredness. Boosts energy without all the jitters. All-natural ingredients designed for energy. Taste a little like cough syrup. Infinite CBD nano shots come in Energy, Rest, and Detox to provide consumers with an easy way to consume CBD to fit your everyday needs. I’ve used the energy shot to help me focus through my chronic pain, the rest shot helped me fall and stay asleep, and the detox shot got me through the day after drinking the night before. With the Infinite CBD brand offering such a diverse product line, there is certainly something for everyone! 10% OFF at Infinite CBD! Vape, Crystaline, Edibles, Suppositories & more! Worldwide Shipping. 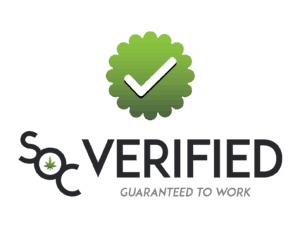 Save money with CBD drink coupons here at Save On Cannabis the World’s largest online cannabis coupon code directory.